Literature References: Chloroethylnitrosourea derivative with antitumor activity. Similar to chlorozotocin, lomustine, nimustine, ranimustine, q.q.v. Synthesis: Johnston et al., J. Med. Chem. 6, 669 (1963). Properties: Loo et al., J. Pharm. Sci. 55, 492 (1966). Decompn studies as related to antileukemic activity: Montgomery et al., J. Med. Chem. 10, 668 (1967). Antifungal action: Hunt, Pittilo, Antimicrob. Agents Chemother. 1965, 710. Toxicology studies: Thompson, Larson, Toxicol. Appl. Pharmacol. 21, 405 (1972). Review of pulmonary toxicity: A. C. Smith, Pharmacol. Ther. 41, 443-460 (1989). Properties: Light yellow powder that melts to an oily liquid; mp 30-32°. Both powder and liquid are stable. Dec rapidly in acid and in soln above pH 7. Most stable in petroleum ether or aqueous soln at pH 4. Non-ionized at pH 7 with consequent high lipid solubility. Sol in water up to 4 mg/ml and in 50% ethanol up to 150 mg/ml: DeVita et al., Cancer Res. 25, 1876 (1965). LD50 in mice (mg/kg): 19-25 orally, 26 i.p., 24 s.c.; in rats (mg/kg): 30-34 orally (Thompson, Larson). CAUTION: This substance is reasonably anticipated to be a human carcinogen: Report on Carcinogens, Eleventh Edition(PB2005-104914, 2004) p III-53. It has the appearance of an orange-yellow solid.Carmustine (bis-chloroethylnitrosourea, BCNU, BiCNU) is a medication used mainly for chemotherapy and sometimes for immunosuppression before organ transplantation. It is a nitrogen mustard β-chloro-nitrosourea compound used as an alkylating agent. As a dialkylating agent, BCNU is able to form interstrand crosslinks in DNA, which prevents DNA replication and DNA transcription. Carmustine for injection was earlier marketed under the name BiCNU by Bristol-Myers Squibb and now by Emcure Pharmaceuticals. In India it is sold under various brand names, including Consium. It is disclosed that carmustine is useful for treating brain tumor, multiple myolema, Hodgkin’s disease and non-Hodgkin’s lymphomas. In September 2017, Newport Premium™ reports that MSN laboratories is potentially interested in carmustine and holds an active US DMF for the drug. Represents new area of patenting to be seen from MSN lab on Carmustine . 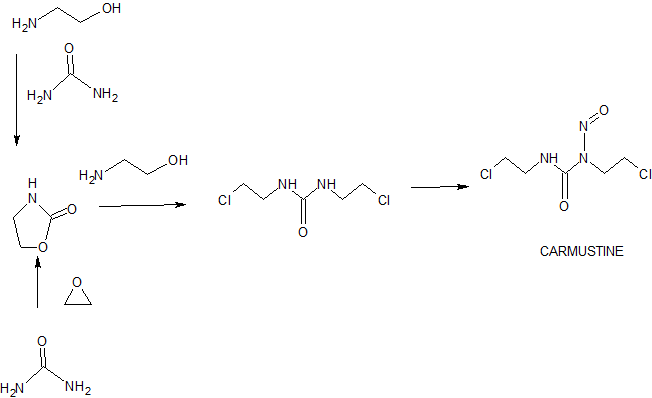 Supratek was investigating SP-1009C , carmustine formulated in the company’s Biotransport carrier technology, for the potential treatment of glioblastoma. However, no further development has been reported since 2000 , and as of February 2004, SP-1009C was no longer listed on Supratek’s pipeline. It is used in the treatment of several types of brain cancer (including glioma, glioblastoma multiforme, medulloblastoma and astrocytoma), multiple myeloma and lymphoma (Hodgkin’s and non-Hodgkin). BCNU is sometimes used in conjunction with alkyl guanine transferase (AGT) inhibitors, such as O6-benzylguanine. The AGT-inhibitors increase the efficacy of BCNU by inhibiting the direct reversal pathway of DNA repair, which will prevent formation of the interstrand crosslinkbetween the N1 of guanine and the N3 of cytosine. It is also used as part of a chemotherapeutic protocol in preparation for hematological stem cell transplantation, a type of bone marrow transplant, in order to reduce the white blood cell count in the recipient (patient). Use under this protocol, usually with Fludarabine and Melphalan, was coined by oncologists at the University of Texas MD Anderson Cancer Center. In the treatment of brain tumours, the U.S. Food and Drug Administration (FDA) approved biodegradable discs infused with carmustine (Gliadel). They are implanted under the skull during a surgery called a craniotomy. The disc allows for controlled release of carmustine in the extracellular fluid of the brain, thus eliminating the need for the encapsulated drug to cross the blood-brain barrier. The Urea. This material is used in good grades, preferably CP, and the amount of urea utilized is the base on which the amounts of nitrosating agent are calculated. The starting material 1,3-bis(2-chloroethyl)urea is commercially available and also may be prepared readily from phosgene and ethyleneimine. Dinitrogen trioxide (N2 O3). Efficacy of reaction has been observed where this nitrosation agent was utilized in preference to the prior use of aqueous NaNO2. It has also been found for stoichiometric reasons that an excess of the nitrosating agent ranging from 10-200% and preferably 10-20% based on urea is necessary to force the reaction to the right and obtain satisfactory completion. Furthermore, it is known from the literature art, Cotton, Advanced Inorganic Chemistry, Interscience, 1972, page 357, that this oxide exists in a pure state only at low temperatures and, therefore, reaction is conducted at nitrosation temperatures of about 0° C. to -20° C.
The Solvent. In contrast to prior art methods, the present reaction is conducted in an organic milieu. The preferred non-aqueous solvent is of the chlorinated variety; i.e., methylene dichloride. Other preferred compounds include related halogenated compounds such as ethylene dichloride, nitro-compounds such as nitromethane, acetonitrile, and simple ethers such as ethyl ether. Other less preferred but operable compounds include esters such as ethyl acetate, simple ketones such as acetone, and chloroform. Solvents to be avoided are olefins, unsaturated ethers and other unsaturated compounds, amines, malonate esters, acid anhydrides, and solvents which would interact with the reactant N2 O3 and the urea as well as the product nitrosourea. In general, the solvent should be low boiling (b.p. less than 120° C. and preferably less than 100° C.). BCNU 1,3-bis(2-chloroethyl)-1-nitrosourea is one of a group of relatively recent drugs used against cancer and since 1972 has been charted by the National Cancer Institute for utilization against brain tumors, colon cancer, Hodgkins disease, lung cancer, and multiple myeloma. The modus of action of BCNU (NSC 409962) is as an alkylating agent. Such an alkylating agent is injurious to rapidly proliferating cells such as are present in many tumors and this action is known as antineoplastic activity. A suspension of 1.11 mmole (0.205 g) of 1,3-bis(2-chloroethyl)urea in 8 ml methylene dichloride at -10° C. was saturated with dinitrogen trioxide in 20% excess of theoretical. The heterogeneous mixture gradually changed to a green homogeneous solution. The methylene dichloride was evaporated, and the residue was extracted with 3× 10 ml hexane. Evaporation of the hexane gave 0.1773 g of oil which was the crude BCNU (NSC 409962). The hexane insoluble portion, 0.0649 g, when treated with benzene, gave 0.020 g of 1,3-bis(2-chloroethyl)urea which was benzene insoluble. The benzene solubles were processed through a silica column (1× 10 cm) and 0.0245 g of crude BCNU was obtained. The combined fractions of crude product amounted to 0.2018 g (85.1%). In order to evaluate the product, the above crude was recrystallized from hexane to yield a first crop and from this first crop the ir spectrum was identical to that of known BCNU. A tlc (benzene on sillica) gave a single spot Rf 0.35 (blue, 254 mμ). A cold solution of 0.2346 g (3.4 mmole) sodium nitrite in 2 ml water was slowly added to a stirred solution of 0.2727 g (1.47 mmole) 1,3-bis(2-chloroethyl)urea in 2 ml 88% formic acid at 0°. After 2 hours at 0°, 0.1449 g (46.0%) of an oil solid phase was removed. The ir spectrum of this fraction failed to agree with that of BCNU. After 2 days a small amount of crystalline BCNU slowly formed in this oil phase. A methylene dichloride extract of the aqueous phase yielded 0.0943 g (30.0%) of an amber oil whose ir spectrum agreed with that of a known sample of BCNU. Treatment of this oil with 5 ml hexane and cooling to 0° gave crystalline BCNU which formed an oil on warming to ambient temperature. A cold slurry at -15° C. of the 1,3-bis(2-chloroethyl)urea (2.0 mmole) in 8 ml methylene dichloride was treated with a small excess of N2 O3. The 1,3-bis(2-chloroethyl)urea is almost insoluble in the cold methylene dichloride, whereas the BCNU product is quite soluble. Thus, treatment of the urea with the N2 O3 changed the slurry to a homogeneous solution. Evaporation of the methylene dichloride gave a quantitative yield of crude BCNU. Purification by silica column chromatography gave 93.4% yield and recrystallization from benzene-heptane gave 85.2% yield of pure BCNU. 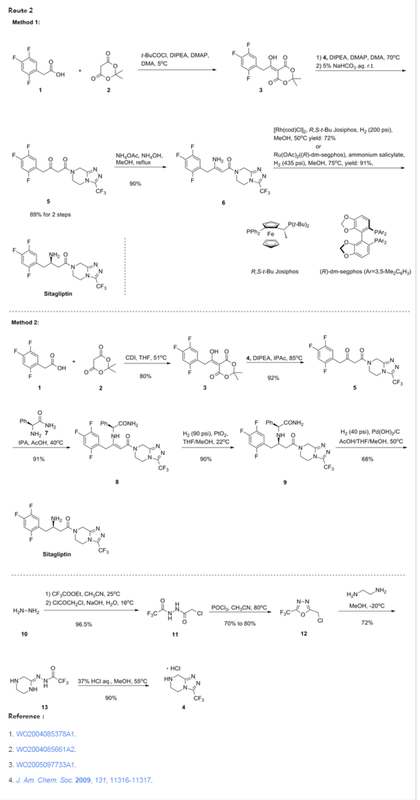 Journal of Medicinal Chemistry (1963), 6(6), 669-81. Process for preparing 1,3-bis(2-chloroethyl)-1- nitrosourea (also known as carmustine) and its intermediate 1,3-bis(2-chloroethyl)urea is claimed. Also claimed are composition comprising them and novel crystalline polymorphic form of carmustine. ,3-bis(2-chloroethyl)-l -nitrosourea is known as Carmustine and is approved in USA under the brand names of BICNU for the treatment of chemotherapy of certain neoplastic diseases such as brain tumor, multiple myolema, Hodgkin’s disease and non-Hodgkin’s lymphomas & Gliadel for the treatment of newly-diagnosed high-grade-malignant glioma as an adjunct to surgery and radiation, recurrent glioblastoma multiforme as an adjunct to surgery. 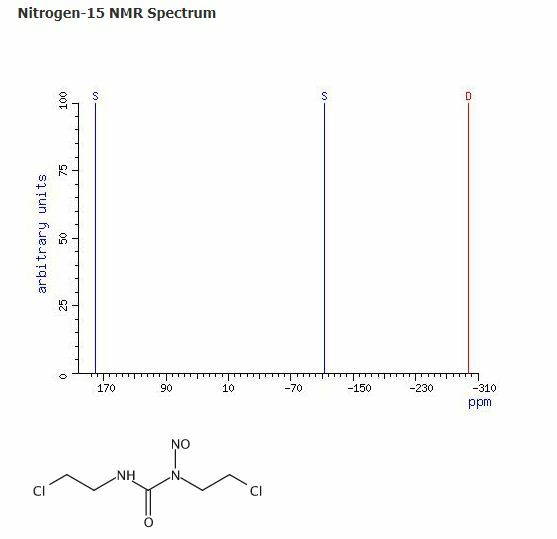 Journal of Medicinal Chemistry 1963, 6, 669-681 firstly disclosed process for the preparation of l,3-bis(2-chloroethyl)-l-nitrosourea. US2288178 patent disclosed the process for the preparation of the compound of formula-2 from aziridine and phosgene. J. Med. Chem., 1979, 22 (10), pp 1193-1198 disclosed the process for the preparation of the compound of formula-2 using 2-chloroethanamine and 2-chloroisocyanoethane. Prior disclosed processes for the preparation of the compound of formula-2 are used hazardous reagents which were difficult to handle in the laboratory. The present inventors have developed an improved process for the preparation of the compound of formula-2 by using easily available raw materials and usage of that compound in the preparation of the compound of formula- 1 to get good yield and having high purity. he present invention is schematically represented in the scheme- 1. 2-chloroethanamine hydrochloride (429.19 gm) was added to the mixture of carbonyldiimidazole (200 gm) and tetrahydrofuran (1000 ml) at 25-30°C and stirred the reaction mixture for 5 minutes. Heated the reaction mixture to 65-70°C and stirred for 14 hours at the same temperature. Cooled the reaction mixture to 25-30°C and water was added to the reaction mixture. Both the organic and aqueous layers were separated and the aqueous layer was extracted with ethyl acetate. Combined the organic layers and washed with aqueous sodium chloride solution. Distilled off the solvent from the organic layer completely under reduced pressure and co-distilled with isopropanol. Isopropanol (100 ml) was added to the obtained compound and stirred the reaction mixture at 25-30°C. Heated the reaction mixture to 80-85°C and stirred the reaction mixture for 10 minutes at the same temperature. Cooled the reaction mixture to 25-30°C and stirred for 2 hours at the same temperature. Filtered the precipitated solid, washed with isopropanol and dried to get the title compound. Yield: 1 10 gm; M.P: 121-125°C. Example-2: Preparation of l,3-bis(2-chloroethyl)-l-nitrosourea compound of formula-1 l,3-bis(2-chloroethyl)urea (50 gm) was added to the mixture of dilute hydrochloric acid (16 ml) and acetic acid (205 ml) at 25-30°C. Cooled the reaction mixture to 0-5°C and stirred for 1 hour at the same temperature. Sodium nitrite (46.6 gm) was added to the reaction mixture in lot-wise over the period of 3 hours at 0-5 °C and stirred the reaction mixture for 1 hour at the same temperature. The reaction mixture was quenched into pre-cooled water at 0-5°C and stirred it for 30 minutes at the same temperature. Filtered the precipitated solid and washed with water. Dissolved the obtained compound in dichloromethane (100 ml) at 0-5°C. The reaction mixture was added to pre-cooled n-heptane (250 ml) at 0-5°C and stirred for 1 ½ hour at the same temperature. Filtered the precipitated solid, washed with n-heptane and dried to get the title compound. Carbonyldiimidazole (8 kg) was slowly added to the pre-cooled mixture of 2-chloroethanamine hydrochloride (14.31 kg) and tetrahydrofuran (40 lit) at 0-5°C in lot-wise under nitrogen atmosphere and stirred the reaction mixture for 5 minutes. Raised the temperature of the reaction mixture to 25-30°C and stirred the reaction mixture for 36 hours at the same temperature. Distilled off the solvent completely from the reaction mixture under reduced pressure. Water was added to the obtained compound at 25-30°C and stirred it for I hour at the same temperature. Filtered the precipitated solid and washed with water. The obtained compound was slurried in water at 25-30°C, filtered and washed with water. Methanol was added to the obtained compound at 25-30°C and stirred it for 1 hour at the same temperature. Filtered the solid, washed with methanol and dried to get the title compound. Yield: 6 kg; PXRD of the obtained compound is shown in figure-3. Example-4: Preparation of l,3-bis(2-ch!oroethyl)-l-nitrosourea compound of formula-1 l,3-bis(2-chloroethyl)urea (6 kg) was added to the mixture of dilute hydrochloric acid (1.9 lit) and acetic acid (24.5 lit) at 25-30°C. Cooled the reaction mixture to 0-5°C, sodium nitrite (5.59 kg) was slowly added to the reaction mixture in lot-wise at 0-5°C and stirred the reaction mixture for 1 hour at the same temperature. The reaction mixture was quenched with pre-cooled water at 0-5°C. Cooled the reaction mixture to -15 to -10°C and stirred it for 1 hour at the same temperature. Filtered the precipitated solid and washed with water. Dissolved the obtained compound in dichloromethane (24 lit) at 5-10°C and stirred for 15 minutes at the same temperature. Both the organic and aqueous layers were separated. Silicagel (3 kg) was added to the organic layer at 5-10°C and stirred for 25 minutes at the same temperature. Filtered the reaction mixture through hyflow bed and washed with dichloromethane. Distilled off the solvent completely from the filtrate under reduced pressure and co-distilled with methyl tertiary butyl ether. Pre-cooled Methyl tertiary butyl ether (12 lit) was added to the obtained compound and stirred it for at 0-5°C. This reaction mixture was added to pre-cooled n-heptane (60 lit) at -15 to -10°C and stirred the reaction mixture for 1 hour at the same temperature. Filtered the precipitated solid and washed with chilled n-heptane. Dried the compound at 0-10°C under reduced pressure. PXRD of the obtained compound is shown in figure- 1 and IR shown in figure-2. Example-5: Preparation of l,3-bis(2-chloroethyl)-l-nitrosourea compound of formula-1 l,3-bis(2-chloroethyl)urea (150 gm) was added to the mixture of dilute hydrochloric acid (48 ml) and acetic acid (612 ml) at 25-30°C. Cooled the reaction mixture to 0-5°C, sodium nitrite (139.8 gm) was slowly added to the reaction mixture in lot-wise at 0-5°C and stirred the reaction mixture for 1 hour at the same temperature. The reaction mixture was quenched with pre-cooled water at 0-5°C. Cooled the reaction mixture to -15 to -10°C and stirred it for 1 hour at the same temperature. Filtered the precipitated solid and washed with water. Purity by HPLC: 95.1 1%, Impurity at RRT -0.08: 4.17%, Impurity at RRT -0.13: 0.63%. “Archived copy”. Archived from the original on 2014-07-11. Retrieved 2015-01-31. Ewend MG, Brem S, Gilbert M, et al. (June 2007). “Treatment of single brain metastasis with resection, intracavity carmustine polymer wafers, and radiation therapy is safe and provides excellent local control”. Clin. Cancer Res. 13 (12): 3637–41. 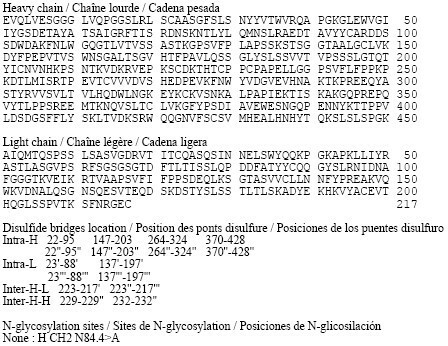 PMID 17575228. doi:10.1158/1078-0432.CCR-06-2095. “Hopkins Medicine Magazine – In Spite of All Odds”. 1 * Johnston et al., J. Med. Chem., vol, 18, No. 1, 1975, pp. 104-106. 2 * Montero et al., C. R. Acad. Sc. Paris, t. 279, Series C, 1974, pp. 809-811. 3 * Ryan et al., CA 17: 1792-1793 (1923). By DR ANTHONY MELVIN CRASTO Ph.D in Uncategorized on September 22, 2017 .